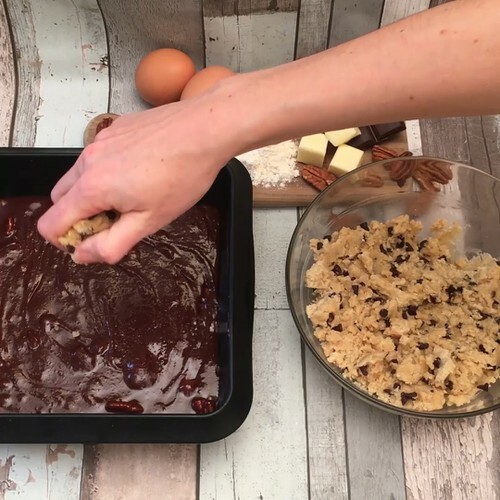 Cookie dough: Whisk the brown sugar and one egg together until the mixture lightens in colour then add 100g of melted butter and 225g of seived flour and the chocolate chips. Mix well to get a smooth dough. Leave for 15 minutes in the fridge to chill. Brownie dough: Melt dark chocolate and 90g of butter in a bowl over hot water. Stir in 2 eggs and add 90g of seived flour, the sugar and the chopped pecans. Mix until smooth. Grease the tin and pour in the brownie batter. Remove the cookie dough from the fridge and crumble it onto the top of the brownie dough. Bake for 30 minutes at 180°C then let the cake cool. 4 Remove the vanilla ice-cream from the tub and use the tub as a cutter to cut into the cake. Put some of the ice-cream back in the box and spread it over the brookie. Enjoy with caramel sauce in your ready made bowl!